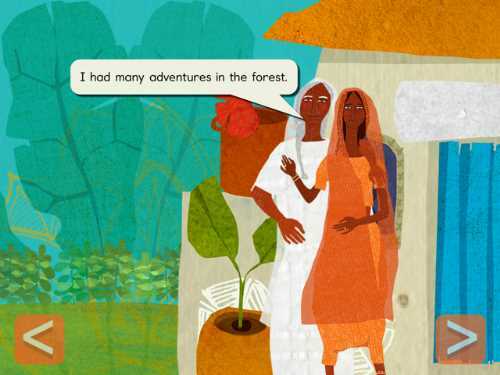 A delightful diversity story about a Bengali Grandma's daring journey through a dangerous forest, accompanied by a simple game and some learning videos. 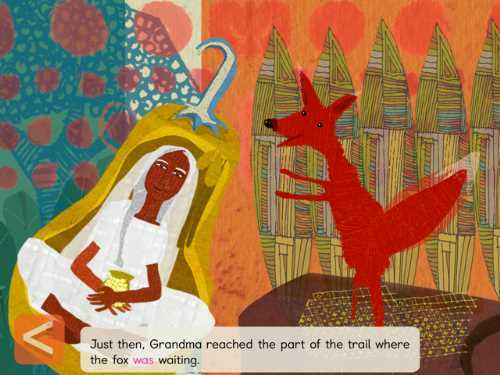 Grandma's Great Gourd is a book app starring an intrepid Bengali woman who must outsmart a fox, a bear, and a tiger during a trip to visit her daughter and grandchildren. Leaving her loyal dogs to guard her property while she is gone, the Grandma travels through a forest on her way to her daughter's house. When the predators try to eat her, she convinces them to wait until her return trip when she will be plumper and tastier. To return safely to her home, Grandma and her daughter come up with a plan to seal Grandma inside a giant gourd and then roll the gourd through the forest. The plan works until the crafty fox figures out the scheme. Luckily, Grandma is close to home, so her dogs rescue her before the fox can eat her. 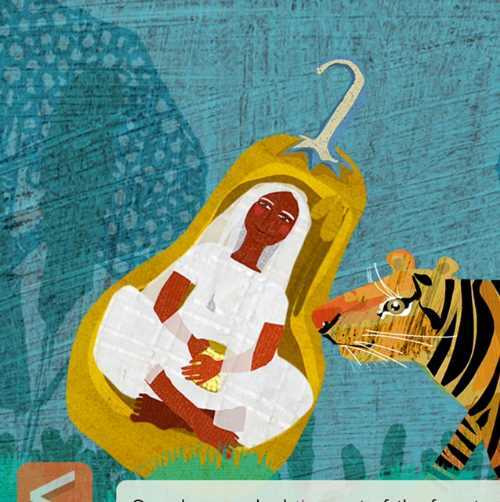 Based on the book Grandma and the Great Gourd by Chitra Banerjee Divakaruni, Grandma's Great Gourd app presents a fun, cultural story about a clever grandma. This story comes alive with brightly colored collage art, which layers over the scene. The voiceover, by the talented Kamala Sandaram, and an original score add to the adventurous atmosphere. 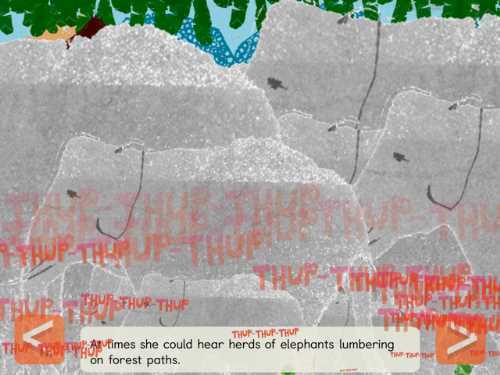 The app amplifies the fun use of onomatopoeia by having some words multiple and fill up the screen. However, the animation is rudimentary, and it takes a little away from this spunky grandma's tale. Nevertheless, children will enjoy the suspense surrounding whether Grandma can trick the animals into shoving the gourd through the forest. With both an Auto-Read and a Read-by-Myself mode, this book app supports emerging readers by having the words highlight as read, in both modes. 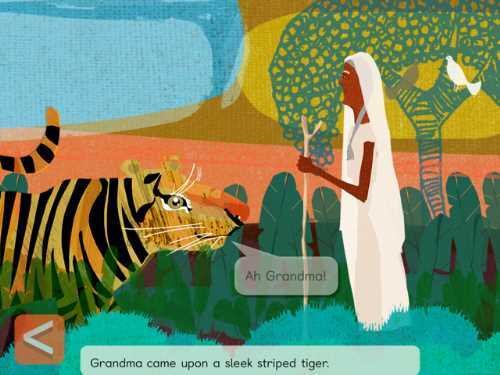 The book app also encourages families to record their own version of the story and create sound effects, which supports co-play between a parent and a child. Grandma and the Great Gourd provides two extra elements beyond the storytelling: a simple physics game in which the player launches Grandma (in her gourd) though the forest (a la Angry Birds) and some educational videos that introduce more of the Bengali culture. The game doesn't work all that well, and it has a repetitive narrative that gets annoying. The videos vary in educational value. Kids can learn to make a traditional dessert and see examples of Alpona, a traditional Bengali art form. But the video about the animals found in the Sundarbans forest only shows photos of animals (instead of video) and doesn't present any animal facts. The one about how to wear a sari is so-so, while the video showing children from around the world pronouncing "Grandma" in their native language is quite charming. We strongly believe that kids should be exposed to other cultures and protagonists of all ages in the media they consume. 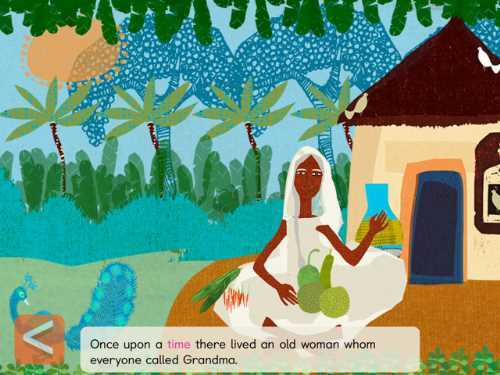 Grandma and the Great Gourd presents a good diversity tale about a strong and resilient older person and it would be a positive and enriching addition to any child's media library of book apps. This book app review of Grandma and the Great Gourd was written by Jinny Gudmundsen.